The effort to divest Tuaspring started in January 2017. DBS and CICC Bank were appointed as advisors for the divestment exercise. By August 2017, more than 50 parties had indicated an interest in Tuaspring and had been provided access to the information memorandum concerning Tuaspring following written approval to disclosure being received from PUB. This information memorandum provided high level information on the asset. As a result of this exercise, the company received several preliminary non-binding bids, all of which were subject to agreement on the investment structure, regulatory and other approvals, and completion of detailed due diligence. Three of these indicative bids attributed an enterprise value of S$1.4 bn to the Tuaspring project. These came from a PRC SOE, a private UAE party and a subsidiary of a Singapore listed company. However, these numbers were not final but subject to various conditions, investment structures and further due diligence. To conduct further due diligence (which required obtaining access to more confidential information relating to Tuaspring) and to make a binding offer, an interested party needed to be approved by PUB to be granted access to such confidential information. By May 2018, none of these parties had completed their due diligence processes, and the time required to complete such due diligence and receive an offer was likely to take a much longer period of time. With the weak electricity market not likely to recover in the near term, the Group will continue to suffer losses. As such, Hyflux decided to commence a transparent financial reorganisation supervised by the High Court of the Republic of Singapore. The effort to divest Tuaspring continued in July 2018 through a collaborative sale process with the sole secured bank lender, Maybank. Of the parties that had expressed an interest previously, only 8 requested to be pre-qualified by PUB. Of the 8 parties, only 2 local parties were pre-qualified by PUB, of which 1 submitted a conditional bid in early October 2018. This conditional bid would have been insufficient to repay Maybank. In my mind, im thinking, just how many other bidders attributed Tuaspring with a value of $1.3 billion, $1.2 billion, $1.1 billion or $1 billion, but were hindered, hampered, obstructed, discouraged or tired out by the arduous procedures so as to be approved by PUB, resulting in only 8 bidders left by July 2018? It must be noted that the exercise started in january 2007 and Tuaspring was already bleeding millions of dollars each month and it seems this "thing" about getting PUB approval may have prolonged the process, culminating in a voluntary court protection in May 2018. And out of the 8 bidders, only 2 local companies were pre-qualified by PUB to bid. By then, with the voluntary court protection, i would think that these 2 local companies would take the opportunity to low ball. It was stated that the bid was insufficient to repay Maybank's loan ( roughly $500 million). Did the need for PUB approval cause Tuaspring's value to plunge from $1.4 billion to less than $500 million? 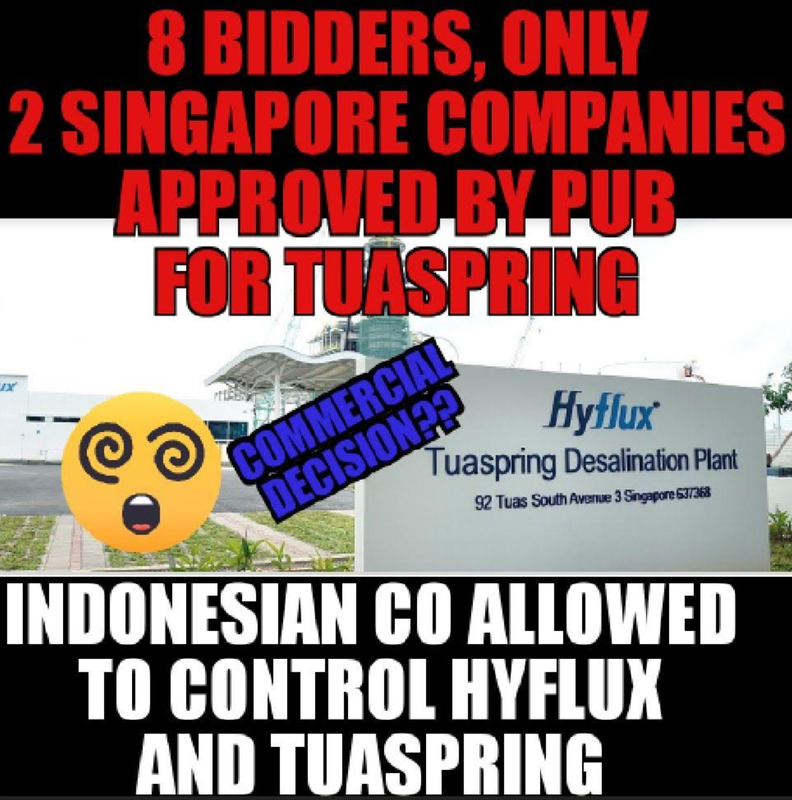 For those unaware, Tuaspring was the "elephant in the room", the entity which brought down Hyflux. The only entity among Hyflux's stable of completed local projects that had an electricity generation component, and it was the excessively oversupplied, overcrowded electricity market we have here in Singapore for "who knows what" that resulted in the millions of losses each month. 8 million population projection as per Olivia Lum, perhaps? Does the Energy Market Authority (EMA) have anything to say about awarding so many licences, resulting in this oversupply of electricity? The funny thing about it all is, after reading the above, one would think that PUB would only allow local companies in due to strategic concerns, right? The Indonesian consortium of Salim and Medco seems allowed to bid for 60% of Hyflux, giving them control of local projects such as Tuaspring ( desalinated water and electricity), TuasOne ( Waste to electricity) , Singspring (desalinated water) and other assets in China and the Middleeast at a steal of $400 million for Hyflux group with a clean balance sheet. Take note that this was said on 20 November 2018 by the minister. Why did it seem that PUB did not approve foreign ownership of Tuaspring at the beginning but later mention that foreign ownership will not affect Singapore's water security? If only the $1.4 billion value or even $1 billion value of Tuaspring had been realised, the 34000 retail investors of Preference shares and Perps, countless other Singaporean investors in their bonds and ordinary sharesholders wouldn't have to face nearly $2.8 billion of their investment, nearly wiped out. A short video made by a member of the telegram group.